Wesley Lewis joined Ignition APG May of 2017 as a Performance Coach. Lewis oversees our entire youth in house training program, BURST, in addition to our college training program. Lewis also serves as an assistant coach for the NFL Combine, NFL Off-Season and NFL Pre-Season training programs. He also works as an assistant Strength Coach with our partnership with the Cincinnati Bengals. Lewis thrives on developing the complete athlete by training them Mind, Body, and Spirit. 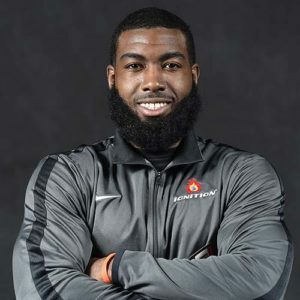 Prior to joining Ignition APG, Lewis attended Tuskegee University for 2 years as an Athletic Training Major and competed on the track team until he transferred to Thomas More College for his last two years. Lewis served as captain his junior and senior years at Thomas More and earned several awards and accolades for track and field. Lewis graduated from Thomas More with his Bachelors in Athletic Training, and holds his Ignition Speed System Certification.